1930s Timber Cottage built as a single-floor dwelling as the northernmost property on the Lower Nash estate. Mid 1970s Occupied by Ernie Jane, a retired local herdsman and his wife Margaret, until her death in 1980. Mr. Jane, a colourful local character, continued to occupy the ramshackle house until 1985. 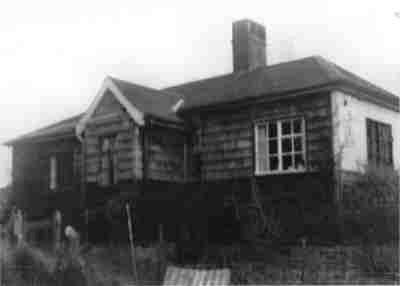 1986-1996 The original timber building was replaced by a modern brick-built bungalow. A vehicular entrance was added and the first owners were Pat and Ian Mackinnon and their two sons. The original Timber Cottage - a single storey timber-built house with limited access. The picture is probably from the 1960s. 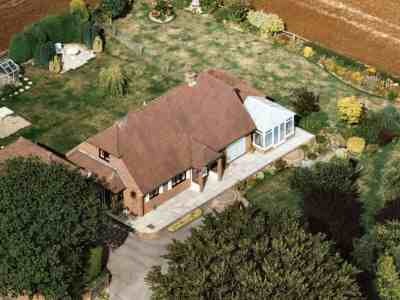 An aerial review of the replacement Timber Cottage, which was built in 1986. The photograph is from 1996. Timber Cottage is the northernmost property on the Upper Nash Estate. Our on-line feature about the Estate includes information about the old and new buildings, and the colourful local character who made the cottage home in the late 1970s and the early 1980s.